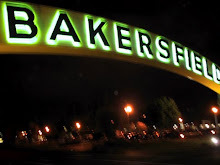 downtown Bakersfield on what I call the "18th Street Corridor" east of Chester Avenue. 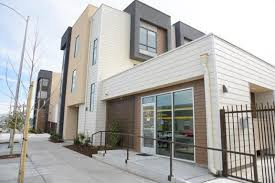 City Councilman Bob Smith said he is eyeing a parcel of land at the intersection of Q and 18th streets for yet another apartment complex, following the success of his 17th Place Townhomes. If the new project is built, it will mark yet another important chapter in the evolution of this important area of town that some have called "Eastchester." 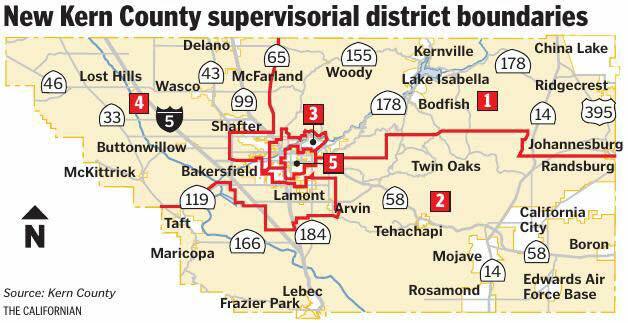 * ... BOARD OF SUPERVISORS: The federal court-ordered redistricting on the Board of Supervisors has thrown the board into some unknown territory: it has evolved from a clubby, polite group to a board where trust is in short supply. Perhaps as never before, the board is so divided that some members have a hard time making eye contact with others. 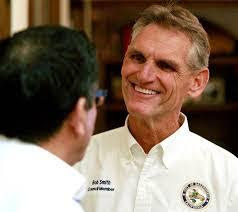 The long feud between Supervisor Leticia Perez and Mike Maggard lingers, and now Supervisor David Couch feels the other four (particularly Maggard and Zack Scrivner) threw him under the bus by carving up his district to appease the federal judge's mandate. * ... SPOTTED ON TWITTER: "If a tree falls in the forest and no one hears it, maybe that's where your kid should be practicing the trumpet." * ... 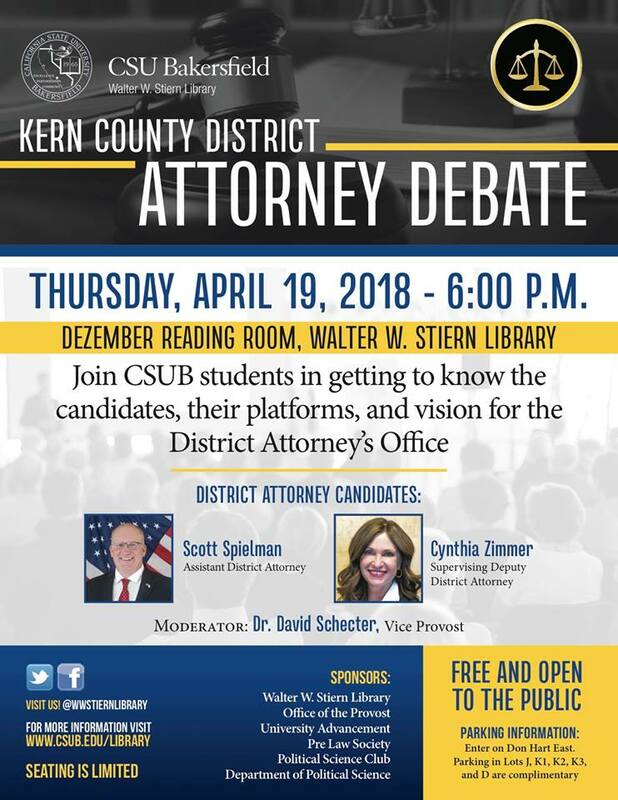 DEBATES: CSU Bakersfield will be hosting a debate between Cynthia Zimmer and Scott Spielman who are running to succeed Lisa Green as Kern County District Attorney. 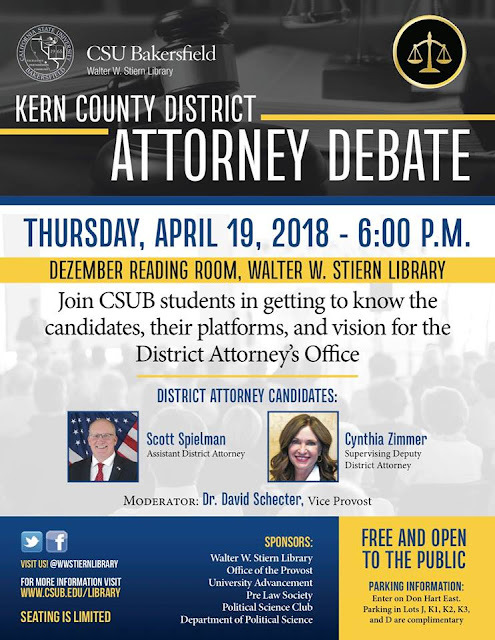 The debate is set for Thursday, April 19, at the Walter Stiern Library. The following week, on Friday April 27, a debate featuring the top office seekers (state Assembly, Sheriff, District Attorney, judges and county supervisors) will be held at the Bakersfield Music Hall of Fame from 6 p.m. to 9 p.m.
* ... APRIL FOOLS: Did you hear that In 'n Out Burger is now offering a "Cali style" burger with avocado and bacon? That was the news sweeping social media last week but before you get too excited, understand that it was apparently an April Fool's joke that got out of hand. The popular burger chain says it has no intention of changing or adding to its menu. 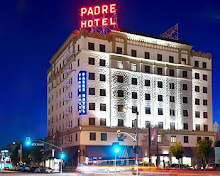 * ... SACRAMENTO NUTTINESS: Did you hear about Assembly Bill 1945? Sponsored by Assemblyman Phillip Ting, the law would ban the sale and use of internal combustion engines in California by the year 2040. That's right, no more gas-powered cars and trucks. Is there a chance the Assembly could approve this bill? 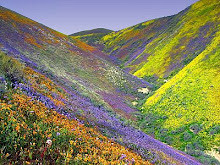 It's California, so go figure. 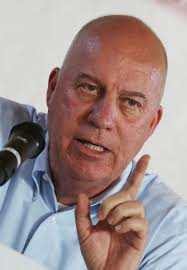 County supervisor David Couch to appear on The Richard Beene Show to talk about how he ended up the odd man out in the county redistricting. Is it over yet? He says not yet. And who remembers the old Chateau Health vitamin store? comply with a federal court order to create two "safe" districts for Latinos? One thing we do know is that District 4 Supervisor David Couch was the odd man out, and he watched (and silently fumed no doubt) when his colleagues on the board took a 12-inch Wusthop carving knife to his district to satisfy the court's mandate. Couch lost his traditional areas of strong support - Taft, Frazier Park and Pine Mountain Club - and instead picked up heavily Hispanic cities. 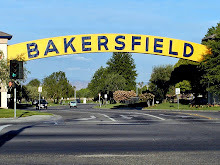 Meanwhile, Zack Scrivner picked up Taft, Frazier Park and Pine Mountain Club and Mike Maggard emerged with a tighter, Bakersfield centric district that actually put his only challenger - Jeff Heinle - out of District 3. Couch has made no bones that he feels betrayed, and he tells me this isn't the end of it. Couch will be my guest on Monday at 1 p.m. on KERN NewsTalk 96.1 FM. Tune in to hear his side of the story. * ... SPOTTED ON TWITTER: "We enter this world alone, we die alone, and we spend the time in between looking for our car keys." * ... SPOTTED ON FACEBOOK: "Let’s get married and have kids so instead of spring break in Cancún we can stop four hours into a road trip to clean puke out of the audio port on the iPad and hose off the car seat." * ... KGET: Jason Galvan has left the KGET morning show. Galvan was originally a sports reporter but moved up to the morning anchor desk after Kiyoshi Tomano left to join the private sector. No word on what he will be doing. * ... RIP MILT: Milton Huggs, the former school teacher and owner of Milt's Coffee Shop, Milt's Iron Horse and Milt's Ranch Inn, died last week. 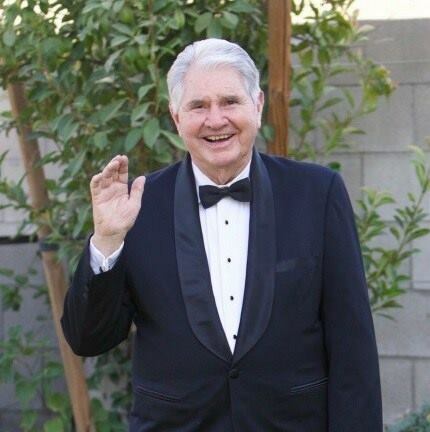 Milton Oscar Huggs was born on November 29, 1929, in Little Rock, Ark., and died on March 26. 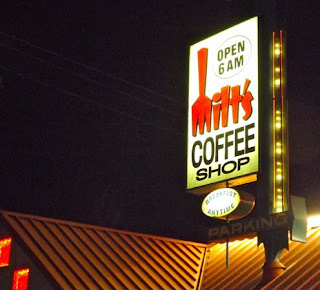 His coffee shop is one of the most popular in town, enjoying a loyal following for years. * ... ALL I WISH: Congratulations to Selah Victor, a 1999 graduate of Highland High School who has co-produced the new Sharon Stone movie "All I Wish." Victor, one of eight children, graduated from UC Irvine and studied acting in England, but she got the bug as a youngster at Juliet Thorner elementary school. She has a long list of commercial appearances, including roles in "Modern Family," "The Office," "Teachers" and on the Jimmy Kimmel Show. "All I Wish" tells the story of a struggling fashion designer who finds love - and second chances - later in life. * ... CHATEAU HEALTH: Who remembers one of Bakersfield's first health food and vitamin stores called Chateau Health that existed in the Stockdale Fashion Plaza in the 1980s? The owner, who worked at KERN radio under the nickname Pete Shannon, did regular radio segments called "The Health Nut" in which he would share healthy living tips. 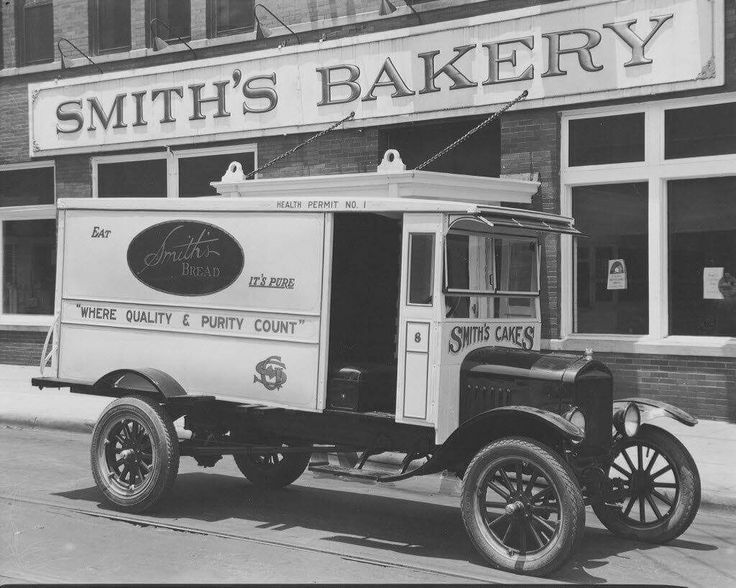 * ... SMITH'S: Enjoy this vintage picture of a Smith's delivery truck back in the day.